Usually the macropods associate without conflict, but the presence of an “oestrus female” – a female sexually receptive, situation regulated by hormones – often induces conflicts between males. They will compete for the chance of mating with her. Several aggressive behaviors are observed. The typical smaller macropod’s behavior is males jump over each other, striking their opponent with their hind feet. As a result of these interactions, a dominance hierarchy is established has access to the oestrus female (Jackson 2003). 1) Gestation: it lasts about 24 days after fertilization. 2) Birth to First Exit from the Pouch (FEP): it occurs when the young has between 24 and 119-126 days of life. The development continues in the pouch. 3) “Hopping in-and-out’ stage”: phase between FEP and Permanent Exit from the Pouch (PEP) – these phase occurs when the young has between 119-126 days. 4) “Young-at-foot” phase: the young is excluded from the pouch, but continues to suckle from outside. The sexual maturity is achieved by females about 136 days of age and by males about 270 days of age (Fisher 1998). Fisher D (1998) Behavioural ecology and demography of the bridled nailtail wallaby, Onychogalea fraenata. Department of Zoology, The University of Queensland. Jackson S (2003). 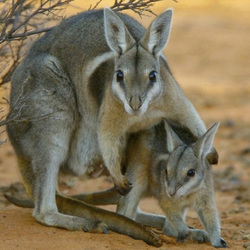 Australian Mammals: Biology and Captive Management. CSIRO Publishing, Collingwood, Victoria.